Get news, articles, advice and tips. 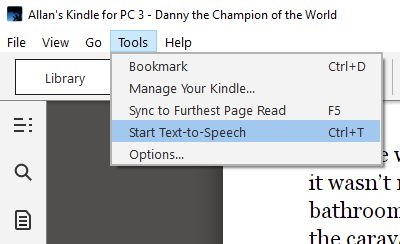 Text to speech has been available for some Kindle book readers for a number of years, but if you wanted to add this feature to the Kindle apps for a Windows or Mac computer, this involved an incredible amount of faffing about. All this has changed with the latest versions of the apps, available from Amazon, which can easily read out text from speech-enabled books using your computer's default voice. To get the latest, free version of the app, make sure you go to the link on the Amazon web site, not the Apple or Windows App Store as the App Store versions are quite old. (In the case of the Apple app, you currently get version 1.12.4 from the App Store, but version 1.19.1 from Amazon. The Mac and Windows versions of the App are very similar, but the screenshots in this blog are taken from the Windows version. To change the default voice on a Mac, click on the Apple symbol (top left of the screen), followed by System Preferences, Accessibility, then Speech to choose your System Voice. In Windows 10, go to the Speech Recognition control panel, click on Text to Speech and then select a voice from those available on your computer. Unfortunately, Amazon has not provided any additional font options for viewing the text with the new PC and Mac apps. 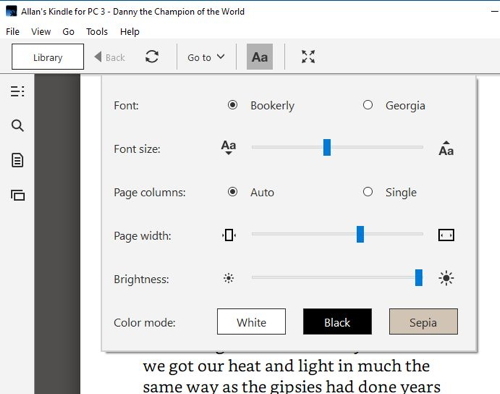 You still just have a choice between Bookerly and Georgia, two very similar serif fonts. In contrast, the iOS app has a choice of eight fonts, though some are very similar to each other. Some Kindle books can be linked with Audible talking books, using 'Whispersync' to provide professional narration, usually by an actor or the author. In this case, text is highlighted as it is read, making it easier to follow. It is a more expensive method to read books as you have to pay for the Kindle version, as well as the Audible talking book, though there is generally a discount on the price of the Audible book. Not all Audible books can be linked with the Kindle version, and there are far fewer Audible versions of books than Kindle. When you download the Kindle book, you will generally be told if an Audible version is available.